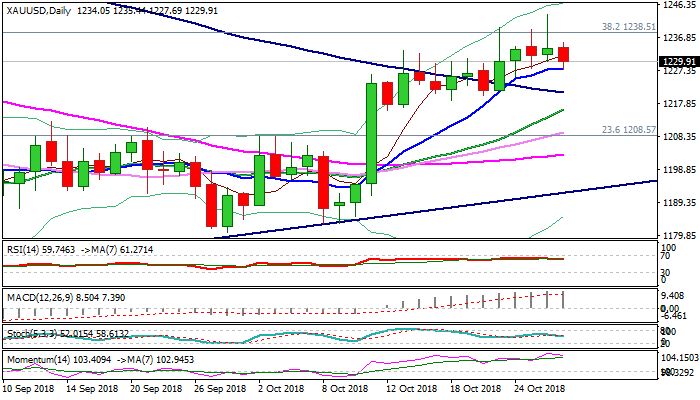 Spot gold trades in red on Monday as bulls start to lose traction after triple failure to firmly break above cracked Fibo barrier at $1238 (38.2% of $1365/$1160 fall). Several daily candles with long upper shadows signal rejection, but further negative signal could be expected on break below 10SMA ($1228) which tracked bull-leg from $1183 and so far holds today's attempts lower. Indicators on daily chart are turning south, with bearish divergence on slow stochastic adding to idea of correction. Overall bullish structure keeps focus at the upside, with consolidative/corrective phase expected to precede fresh advance and final break above $1238 pivot. Immediate bulls will remain intact while 10SMA holds, but dips towards pivotal support at $1220 (Fibo 38.2% of $1183/$1243, reinforced by broken 100SMA) cannot be ruled out. Break below $1220 would weaken near-term structure and sideline bulls, as thin daily cloud could attract fresh weakness.